Leishmania parasites cause visceral leishmaniasis (VL), an important infectious disease that is endemic to large parts of the world and often leads to epidemics. Sand flies are the primary transmission vector for the parasite in endemic regions. We hypothesized that sheep might serve as an overlooked reservoir for Leishmania transmission to humans due to the asymptomatic nature of infection in many species. As a preliminary test of this hypothesis, the aim of the present study was to investigate sheep in an area of China that is endemic for the desert sub-type of zoonotic VL and establish if they are potential carriers of Leishmania. Sheep tissue samples were collected from abattoirs in VL endemic areas of Jiashi County, China during the non-transmission season. rK39 immunochromatographic tests were performed to detect the presence of the parasite in blood samples. In addition, DNA was extracted from the blood, and used for detection of the Leishmania-specific internal transcribed spacer-1 (ITS-1) genomic region using a nested polymerase chain reaction (PCR) approach. PCR products were further analyzed to identify restriction fragment-length polymorphism patterns and representative sequences of each pattern were selected for phylogenetic analysis. The rK-39 and nested PCR data indicated positive detection rates for Leishmania in sheep of 26.32 and 54.39%, respectively. The phylogenetic analysis revealed that all of the samples belonged to the species L. infantum and were closely related to strains isolated from human infections in the same area. 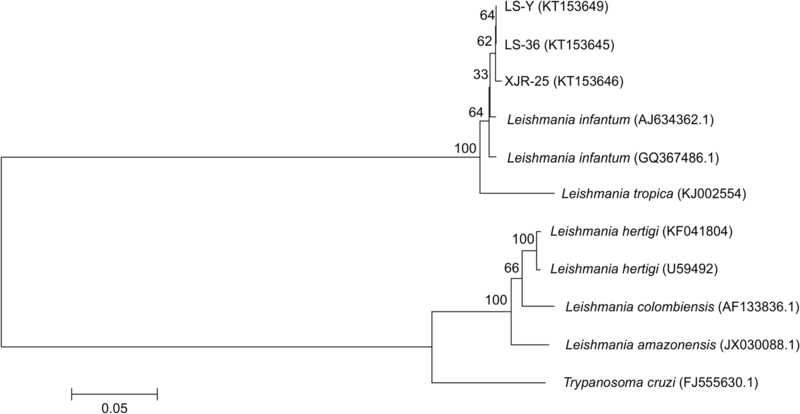 Sheep could be a potential host for Leishmania in VL endemic areas in China and may be an overlooked reservoir of human VL transmission in this region. To further confirm livestock as a potential host, further verification is required using a sand fly biting experiment. Kala-azar, also known as visceral leishmaniasis (VL), is a parasitic disease caused by various Leishmania species and is endemic in many countries. Sand flies are the main transmission vector for the disease. The primary clinical features of VL include long-term irregular fevers, splenomegaly, anemia, emaciation, leukopenia, and an increase in serum globulin levels. Most untreated VL patients die within 2 years of contracting the illness due to related complications [1–3]. Approximately 200,000–400,000 new cases of VL are reported annually, with more than 90% found in India, Bangladesh, Sudan, South Sudan, Ethiopia, and Brazil [4, 5]. In China, VL is characterized according to differences in endemic area, pathogen species, and vector species into anthroponotic VL, a mountain sub-type of zoonotic VL, and a desert sub-type of zoonotic VL [6, 7]. The desert sub-type of zoonotic VL is specifically caused by Leishmania infantum [8, 9] and is most prevalent in Minfeng, the Bachu Reclamation Regions, the eastern regions of Jiashi in Xinjiang, Ejin Banner in Inner Mongolia, and Dunhuang in Gansu [10–12]. The desert sub-type of zoonotic VL is highly endemic to Jiashi County of Kashgar Prefecture in Xinjiang which is located near the central and lower reaches of the Tian Shan mountain range floodplain in the western margins of the Tarim Basin [13, 14]. Most patients with this sub-type are infants under 2 years of age and the mortality rate can reach 95% or higher if left untreated . In 2007, only 19 cases of VL were reported in Jiashi County; however, there were 214 reported cases in 2008, largely due to the fact VL is often neglected and its severity is thus underestimated [16–18]. Moreover, accumulating evidence in recent years points to a continuing upward trend of leishmaniasis cases in the region, suggesting an epidemic outbreak . Gaining a detailed understanding of this situation is further complicated by the fact that humans and animals infected with Leishmania are often asymptomatic or show latent infections. These asymptomatic hosts may therefore play an important role in the transmission of the parasite [20–23]. Based on previous evidence, it has been proposed that natural foci exist within the desert sub-type of zoonotic VL endemic areas and that wild animals may serve as hosts [24–28]. Although the local residents of this area do not tend to keep dogs as pets, wild rodents and other domestic animals have been considered to be potential hosts for Leishmania in other regions [29, 30]. Accordingly, since sheep are by far the most common livestock animal in Jiashi County, we hypothesized that sheep might be an overlooked reservoir of Leishmania in this region, contributing to the increasing incidence of leishmaniasis. Importantly, the small number of VL cases in China suggests that the disease could feasibly be eliminated if appropriate control strategies are implemented. However, the main source of VL infection in the desert sub-type of zoonotic VL endemic areas is still unknown, thereby hindering such efforts [25, 27, 31]. In addition, there are currently no strategies or programs in place to control the disease, except for treating patients on a case-by-case basis. Therefore, identifying the primary host species for Leishmania in China would be an important step towards the prevention of VL. A critical tool that can be used for such analysis is Leishmania-specific polymerase chain reaction (PCR) targeting the internal transcribed spacer 1 (ITS-1) region between the genes encoding the SSU and 5.8S rRNAs. [32, 33]. To identify potential sources of VL transmission in China, we used both rK39 immunochromatographic tests and ITS-1 nested PCR to examine Leishmania infection rates in tissue samples from sheep collected in endemic areas of the desert sub-type of zoonotic VL. We also performed phylogenetic analysis and compared the strains isolated from sheep with those retrieved from human patients in the same area. A total of 114 sheep were investigated in this survey, including 99 males and 15 females. The positive detection rate of sheep blood samples was 26.32% (30/114), determined using the rK39 immunochromatographic strip test (Table 1). There were no significant differences between positive detection rates in sheep of different dental ages (P > 0.05, χ2 test or Fisher’s exact test were applied to compare data between genders within dental ages and the total) (Table 1). The 285-bp bands representing the ITS-1 target sequence of Leishmania were successfully amplified in many of the nested PCRs (Fig. 1), and no bands of other sizes were detected. The positive infection rate of Leishmania across all sheep was 54.39% (62/114) using this method (Table 2). Again, no significant differences were found in the positive detection rates among sheep of different dental ages (P > 0.05, χ2 test or Fisher’s exact test as appropriate to compare data between genders within dental ages and the total) (Table 2). The HaeIII restriction maps of all positive ITS-1 nested PCR products were determined to be identical, with bands 161 bp, 69 bp, and 55 bp in size (Fig. 2). This indicated that the target bands all originated from genetically similar parasite strains. As shown in Fig. 3, the target sequences (i.e., those most closely related to the LS-36 strain, identified in this study) isolated from the sheep blood samples (GenBank:KT153645) and LS-Y (the positive control Leishmania strain MHOM/CN/08/JS-1, GenBank:KT153649) clustered in the same phylocluster. This suggests that the local sheep were infected with L. infantum. Importantly, LS-36 clustered together with sequences obtained from blood samples isolated from human VL patients from Jiashi County (XJR-25, GenBank:KT153646). Some studies have suggested that asymptomatic infected humans may play an important role in the spread of anthroponotic Leishmania donovani, although further verification by xenodiagnosis using the competent phlebotomine vector Phlebotomus argentipes is required [21, 22, 34, 35]. Given the equally high rate of asymptomatic livestock, the possibility that asymptomatic sheep may also serve as an overlooked host for Leishmania in endemic areas cannot be excluded . In our study area in China, wild rodents such as Lepus yarkandensis and asymptomatic infected humans are generally considered to be the potential hosts of Leishmania, and most infections have thus far been limited to infants under two years of age [15, 37]. In these endemic areas, cases of leishmaniasis are temporally isolated, with a season of high incidence between September to March and peak incidence from October to December. However, there has been a trend in recent years towards increasing Leishmania outbreaks ,and several patients have become ill during the non-transmission season, although they recovered after treatment. These patients were unlikely to be a source of infection for the sand fly vector Phlebotomus wui, especially during the non-transmission period when the vector is not present. There are three conditions necessary for the maintenance of mediated infectious disease foci: presence of a pathogen, a transmission vector, and an appropriate host. P. wui has previously been determined to be the main vector for Leishmania in the endemic desert sub-type of zoonotic VL areas of Jiashi County. The species usually begins to appear in early May and disappears in early September, matching the high Leishmania transmission season [38, 39]. In our study, the samples were collected from sheep in April, which is the non-transmission season but is close to the next transmission season. However, we consider that the detection of Leishmania infection in sheep at this time is unlikely to have arisen due to P. wui transmission, although this could reflect sand fly infection from the previous season. The conventional method to detect the parasites that cause VL is to use an rK39 dipstick, which is an in vitro diagnostic medical device designed for the qualitative detection of antibodies specific to members of the L. donovani complex in human serum [40–42]. However, this tool can only be used to identify patients with active disease and cannot detect asymptomatic carriers [43–47]. Leite et al. evaluated the detection efficiencies of ITS-1 nested PCR and kDNA PCR hybridization to detect L. infantum infections in asymptomatic dogs, and found that the detection rate of ITS-1 nested PCR was up to 83.3% for conjunctival swabs and 56.7% for blood samples, which was higher than the13.3% detection efficiency for the kDNA PCR hybridization method. Pilatti et al. also found that ITS-1 nested PCR detection rates were equally high (73.9%) for symptomatic dogs. These studies indicate that ITS-1 nested PCR has excellent detection sensitivity for both symptomatic and asymptomatic Leishmania-infected animals [50, 51]. We further confirmed this good detection sensitivity of Leishmania in this region of China with a much higher detection rate from ITS-1 nested PCR (54.39%) than obtained with the rK39 test (26.32%).These results confirm that the ITS-1 nested PCR is a highly specific and sensitive method for detecting Leishmania infection. Finally, our phylogenetic analysis indicated that the sheep were specifically infected with L. infantum. There was a close phylogenetic relationship between the LS-36 strain identified in the sheep and the XJR-25 strain isolated from human VL patients from Jiashi County. This indicates that Leishmania transmission could potentially occur between sheep and humans in this area of China; however, further investigations on potential sheep infectiousness through xenodiagnosis assays using competent phlebotomine vectors (e.g. P. wui), are still needed to understand the transmission routes in this region. One main caveat of the study is that although the sheep were bred and raised locally, imported sheep largely come from the Ili region of Xinjiang. The majority of imported sheep have been in Jiashi County for 0.5–1 years and our data cannot determine whether they became infected with Leishmania locally or arrived with the infection. However, as the Ili region is not endemic for VL, we consider it unlikely that they were infected before transfer. Our data suggest that asymptomatic sheep infected with Leishmania contribute to VL transmission between seasons in China. This overlooked reservoir represents an important potential source of local infection for the human population across seasons. Although further verification by Phlebotomus argentipes xenodiagnosis is still needed, our study suggests that consideration of asymptomatic sheep as hosts will be crucial for the future development of VL prevention strategies. During mid-to-late April of 2014, a total of 114 samples of approximately 3 mL blood were collected from sheep in 6-mL ethylene diamine tetraacetic acid (EDTA) blood collection tubes (BD Vacutainer; Becton Dickinson, Franklin Lakes, NJ, USA). The animals were all at least 1 year of age when slaughtered and were selected from local abattoirs with the approval and management of animal husbandry and veterinary departments in the endemic areas of Jiashi County. Sampling was performed in abattoirs of six townships across the county (Fig. 4). All samples were identified with a unique number code and stored at 4 °C until use. The study did not involve animal husbandry or sacrifice, and samples were collected from scheduled slaughters without influencing abattoir routines. For the immunochromatographic identification of Leishmania infection, 20 μL samples of whole blood were taken and added to the sample pads of rK39 strips (InBios, Seattle, WA, USA), followed by the addition of 1–2 drops of phosphate buffered saline (PBS). Results were obtained by visually assessing the strip for the presence of bands after 5–10 min. Total DNA was extracted from 300 μL whole blood using an SE Blood DNA kit (Omega Bio-Tek, Norcross, GA, USA), following the manufacturer’s instructions. The purified DNA was stored at − 20 °C until analysis. Extracted DNA samples were used the template in ITS-1 nested PCR  with the primers indicated by Ferreira et al. . Primers were synthesized by Invitrogen Trading Shanghai Co., Ltd. (Shanghai, China). An Applied Biosystems PCR thermocycler was used for all reactions (Applied Biosystems, Foster City, CA, USA). The first round of PCR was performed using a total volume of 50 μL, including 1 μL DNA template, 25 μL MAX PCR Master Mix (TaKaRa Biotechnology (Dalian) Co., Ltd., Dalian, China), 1 μL of each primer (5′-CTGGATCATTTTCCGATG-3′ and 5′-TGATACCACTTATCGCACTT-3′) at 10 μM, and ddH2O to reach the final volume. Positive and negative controls were also included, with DNA from L. infantum strain MHOM/CN/08/JS-1 as the positive control. The PCR conditions were 94 °C for 5 min; 30 cycles of 94 °C for 30 s, 53 °C for 30 s, and 72 °C for 30 s; and a final extension step at 72 °C for 5 min. The second PCR was performed in a total volume of 25 μL, including 10 μL of a 1:40 dilution of the PCR products from the first PCR as a template, 12.5 μL MAX PCR Master Mix, 1 μL each primer at 10 μM, and up to 25 μL ddH2O to reach the final volume. The PCR conditions were the same as those used in the first reaction. The sizes of the target fragment were between 280 and 330 bp and were detected by electrophoresis of 5 μL of the PCR products from the second reaction on a 1.5% agarose gel, visualized using a gel imager. ITS-1 positive nested PCR products were digested using 1 μL of the restriction endonuclease HaeIII (TaKaRa Biotechnology (Dalian) Co., Ltd.; 50 ng/μL), 2 μL 10 × M Buffer, ≤ 1 μg DNA, and 20 μL sterilized water. The mixture was incubated at 37 °C in a water bath for 1 h. Next, 5 μL of the digested product was separated by electrophoresis on a 1.5% agarose gel to obtain restriction maps for RFLPs. If ITS-1 positive nested PCR products had the same restriction maps, they were considered to be from the same phylogenetic group. Representative samples of DNA from each group were sent to Shanghai Sangon Biological Engineering Technology & Services Co., Ltd. (Shanghai, China) for direct sequencing in both directions using the PCR primers. Sequences were edited using DNAstar software (DNASTAR Inc., Madison, WI, USA), and BLAST (National Center of Biotechnology Information, NCBI) was used to determine related strains by identifying published sequences with high homology to the target sequence. Sequence alignment and phylogenetic analysis were performed using ClustalW and a neighbor-joining method using MEGA 5.0 (DNASTAR Inc.), respectively. We thank Prof. Jun-Yun Wang (National Institute of Parasitic Diseases, Chinese Center for Disease Control and Prevention) for supplying the standard strain of L. infantum (MHOM/CN/08/JS-1). We also thank Xinjiang Uygur Autonomous Regional CDC and Kashgar Prefectural CDC for their help with the fieldwork. Finally, we are grateful to all of the reviewers who have provided valuable comments for this paper. This work was supported by the National Key Technology Research and Development Program (No. 2014BAI13B05). The funders had no role in study design, data collection, analysis, the decision to publish, or the preparation of the manuscript. The sequences generated and/or analyzed in the study are available in the GenBank repository, KT153649(LS-Y): https://www.ncbi.nlm.nih.gov/nuccore/KT153649; KT153645(LS-36): https://www.ncbi.nlm.nih.gov/nuccore/KT153645; KT153646(XJR-25): https://www.ncbi.nlm.nih.gov/nuccore/KT153646; AJ634362: https://www.ncbi.nlm.nih.gov/nuccore/AJ634362; GQ367486: https://www.ncbi.nlm.nih.gov/nuccore/GQ367486; KJ002554: https://www.ncbi.nlm.nih.gov/nuccore/KJ002554; KF041804: https://www.ncbi.nlm.nih.gov/nuccore/KF041804; U59492: https://www.ncbi.nlm.nih.gov/nuccore/U59492; AF133836: https://www.ncbi.nlm.nih.gov/nuccore/AF133836; JX030088: https://www.ncbi.nlm.nih.gov/nuccore/JX030088; FJ555630: https://www.ncbi.nlm.nih.gov/nuccore/FJ555630. WPW, SH, and CJZ designed the study and wrote the first draft of the manuscript. WPW is the overall project leader. SH, KC, IO, JZ, and KK implemented the study and collected the samples. WPW and YYH were in charge of field work coordination to ensure that the project was implemented properly. SH, LYW, and YW were responsible for the lab testing of the samples, supervised data entry, and analyzed the data. KC was involved in manuscript drafting and revision. WPW and CJZ reviewed the manuscript. All authors read and approved the final manuscript. This study was approved by the Ethical Committees of the National Institute of Parasitic Diseases, Chinese Center for Disease Control and Prevention (No. 2014–009), and complied with applicable laws and regulations, with the approval and management of animal husbandry and veterinary departments of Jiashi County.